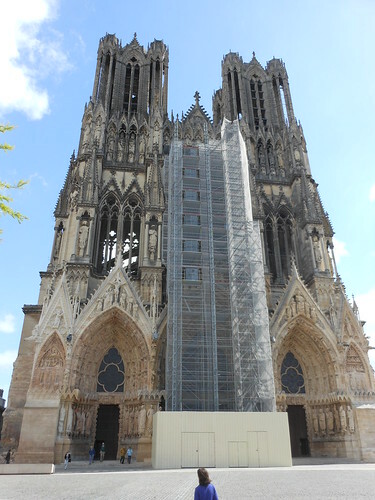 We had two goals for sightseeing in Reims: visiting the cathedral and sampling champagne. After breakfast at home, we set out for Gare de l’Est and drank coffee while we waited to get on the train. On the TGV, I observed three men in their late 30s who sat around a table. They must have been musicians as they kept passing around a score and fancy headphones, while discussing the music. One man was a classic nerd — a little skinny, basic wire frame glasses, careless about his appearance. Another was a goof, always cracking jokes with more fashionable glasses (big plastic frames) and unruly hair. The third was athletic with radiant skin, classically handsome, always snacking on a piece of fruit. When they got off the train, he had the fold up bike. The 45-minute ride flew by. Though it was only 11am, John’s appetite was stirred as we walked from the station down the main street lined with restaurants. 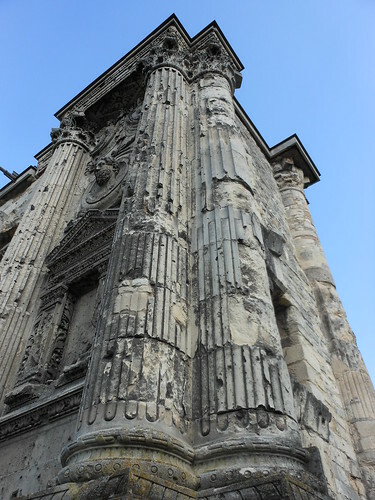 I gave him some bread to gnaw on and we continued through the shopping district, past a glorious Art Nouveau theater in disrepair, before arriving at the grand Cathedral, built in the 13th century and the site of the coronations for the French kings. 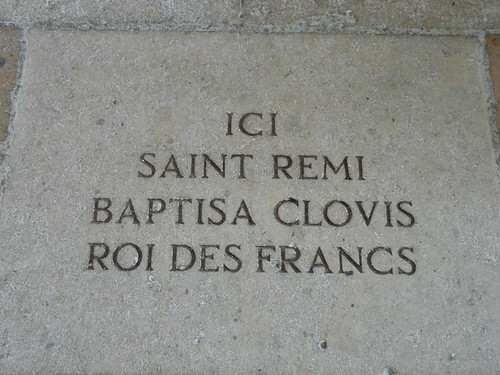 Of course, a church has been on this site for much longer; Clovis, considered the first king of what we now call “France” and the first ruler to unite the French monarchy and the Roman Catholic church, is said to have been baptised here in 496. The cathedral features a mix of old and contemporary stained glass, including work by Marc Chagall. 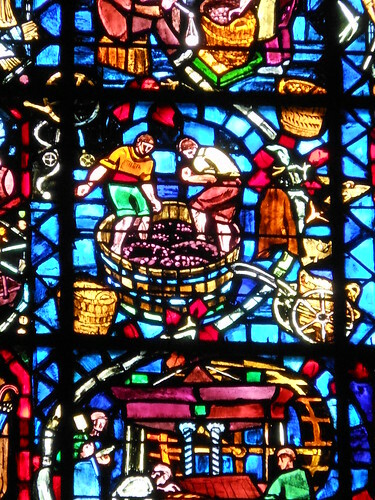 I took particular delight in a window from the 1950s celebrating the wine traditions of the region. We walked behind the mammoth cathedral and found two restaurants. One was fully booked, but the other had two free seats at the bar. Two servers and the one woman behind the bar (she seemed like a manager) were in constant motion for the hour or so that we were there. The place was packed for lunch and the older couple next to us at the bar followed the prix fixe lunch menu with plate after plate coming out for them. John and I were happy with giant salads and marveled at the competence and efficiency of the manager. This is a woman truly entitled to her legally-required month of vacation. During the course of the day, we stopped in three establishments (lunch, break, dinner), each serving Grimbergen beer. John tried a different variety at each place: blonde, ambrée, and abbaye. After lunch we visited the Saint Remi Basilica, home of the relics of Saint Remi, the bishop who baptised Clovis. We continued walking away from the historic center into the newer parts of town that seemed much less welcoming. After a couple consultations with the map (I recommend writing to the tourism board before the trip. They sent me a handy map and brochure. ), we arrived at Taittinger! We had a short wait in a large perfectly white room before the next tour. After a video, our fabulous guide Audrey led the group of 12 down to the ancient cellar. She expertly walked up and down the narrow spiral staircase in her high heels. 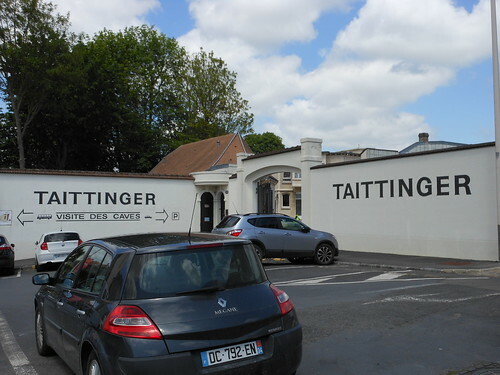 The tour fascinated us first because we had no idea how time intensive the production of Champagne is and second because Taittinger’s caves started as Roman quarries and later were used by monks whose abbey was once on the Taittinger property. There’s tons of graffiti in the caves from all eras. Depending on which variety they are producing, the vintners blend different vintages to maintain their signature flavor or, during a year of particularly good weather, produce a vintage using grapes only from that year. After the sorting stage, the wine is aged, typically for 4 years. After aging comes clarifying. The wine is placed on angled racks to force the yeast into a ball at the top of the neck. A small staff of two or three persons turns the bottles every few days. The beautiful door in the picture features restored iron work from the original abbey. Because of the high humidity (~80%), the wood for the door needs to be replaced on a regular basis. The yeast is removed by freezing the tops of the bottles. The ice containing the yeast is removed, the wine topped up, and the bottles corked and labeled; these processes are done by machine. 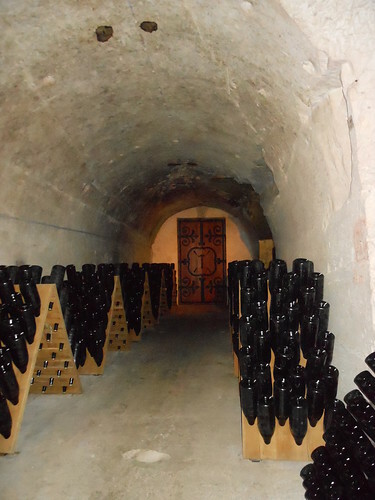 At the end of tour, Audrey led the group to the pristine tasting room featuring a display of Taittinger’s specially designed bottles for the World Cup (they are the official champagne of the event). She also imparted us with the following wisdom: the bigger the bottle the better it tastes (the biggest is called Nebuchadnezzar – 15 liters, but a magnum is just fine). John and I paid for two tastings. We both had the Brut — their signature champagne — and then chose two to share. I chose the Prelude, a blend, and John the 2006 vintage. All were lovely and not overly dry; I should have taken more notes. We were both slightly alarmed thinking about how little solid ground was underneath us with all those caves! 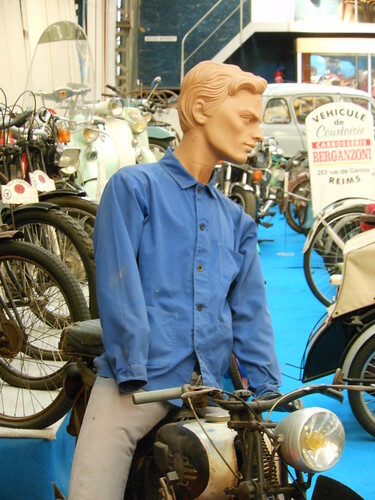 Afterwards we walked to the Reims Automobile Museum, whose collection also included bicycles, motorcycles, and toy cars. It was an impressive assemblage and some museum studies person could write a thesis on their use of manikins. We were slowly making our way back into the old town and visited a small art deco masterpiece, a library funded by Andrew Carnegie. It’s just behind the cathedral and worth a peek. By the Hotel de Ville, we sat for coffee and beer and wondered about the place across the street called “Bar Club.” The late afternoon took us to the Porte de Mars, a Roman triumphal arch from the 3rd century. We wanted to eat dinner before taking our train back to Paris, so we found a place on the main pedestrian street, sat in the sun, and had flammkuchen and pizza. On the train home, John was tortured by the sounds of crunching and rustling plastic bags. I try to travel with earplugs all the time (even at home — I keep them in my purse), but I forgot them for this daytrip. Since Gare de l’Est wasn’t far from where we stayed the last time, we went to say hello to the Canal St Martin and the restaurant we ate at on the first night of that trip. 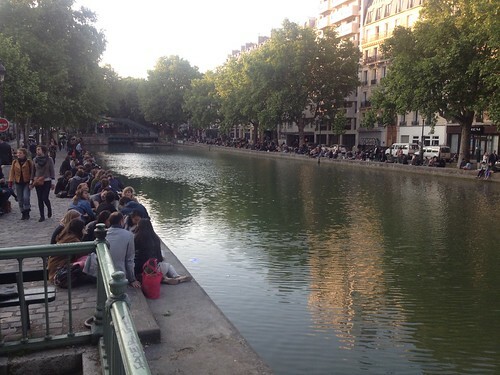 It was a beautiful night and all the kids were out on the canal drinking Heineken or Kronenburg. We continued to rue Jean-Pierre Timbaud where all the bars proudly list their rum-based cocktails. I went looking for two specific music clubs, but couldn’t find them. Instead we stumbled upon Pili Pili, where the Black-Flag-shirt-and-suspender-wearing bartender made us a mojito and Cuba Libre with Havana Club rum. There was a picture of Laura Palmer from Twin Peaks on the wall and the whole bar got super psyched when “La Bamba” came on. Surreal and so awesome. We kept walking for another 30 minutes and visited Le China to say goodbye. I was hungry again and devoured vegetable dim sum. John had a Manhattan and we watched the two girls DJ-ing. I could live the rest of my life without hearing “Love Shack” ever again, but I forgave them. 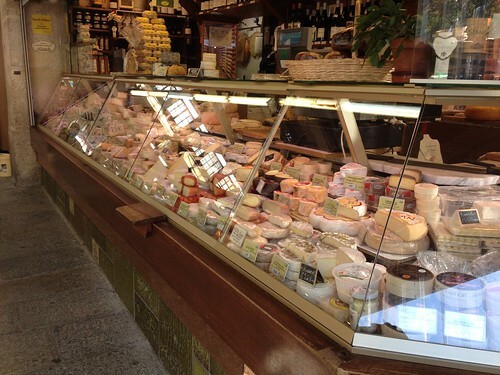 The next morning we gave our farewells to the Bastille neighborhood by buying almond and chocolate croissants and chocolate madeleines at a beautiful boulangerie and visiting the market at Place d’Aligre one more time. John took me to Bistro du Coin where he’d been getting his coffee most mornings. At Montparnasse, we bought lunch to eat on the train to Vendome. We arrived at 1pm and all of the passengers disappeared immediately into cars and buses and then we were the only people left in the station. I wasn’t entirely sure how we were going to get from the TGV station to the rental car agency. Once we realized that taxis don’t appear automatically, we walked back into the station and an agent came to our rescue by calling us one. We were to pick the car up from a Total gas station. A very busy man did the paperwork at lightning speed and referred to John only as “mister”, while his large dog (part pit bull) slept in the office. Finally, he hooked us up with . . . a Renault Kangoo, the same vehicle the postal service uses. 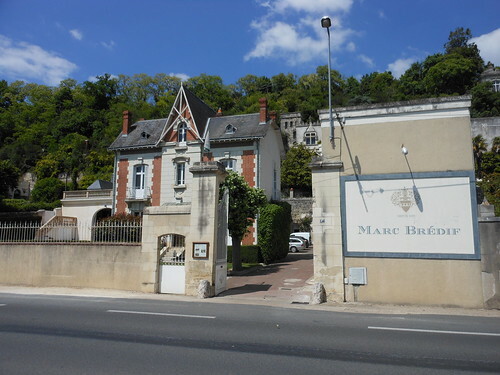 We had no trouble finding our way to Vouvray where we got a real education at Domaine Marc Bredif on the Loire River. Because of our timing, we did the tasting first and then took a short tour with Nathalie. Our guide for the tasting was a young man who grew up in the area. He started us off with sparkling Vouvray (which I didn’t know existed — why is this amazing stuff not common in the US?) and then the still Vouvray. He showed us how well the wine ages with a 1988 vintage and a younger private reserve. Then he moved to their sweet wines, a recent Nectar and an aged Nectar from 1990, made with grapes harvested at the very end of the season when the sugar levels are highest. We also tried two Chinons, red wines from a region southwest of Vouvray. 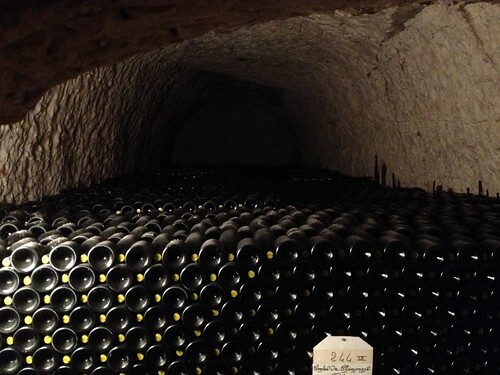 During the tour of the caves, dug right into the hillside, we saw the room where the vintners have stored bottles from the best vintages. Like something out of Indiana Jones, arches were cut into the walls all the way around the shadowy circular room with the vintage years painted over top the arches. A large stone table sits at the center. Only four bottles remain of 1874. We bought a bottle of the sparkling and the private reserve from 2009 to take with us! It took some finagling, but we found our way to the bed and breakfast in Blere around 5pm. Le Moulin du Fief Gentil proved to be another fabulous recommendation from Rick Steves (he sent us to Marc Bredif too where we met another Rick Steves-reading couple). Here is the view behind the old mill building. 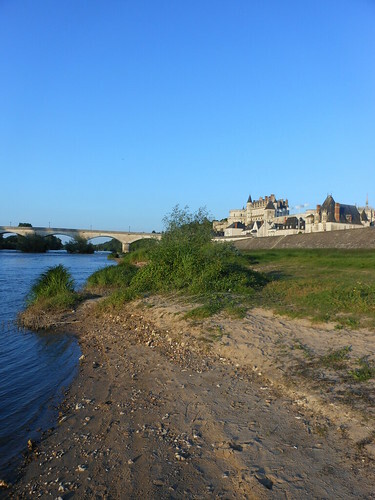 For dinner, we drove about 20 minutes north to Amboise, located at the widest part of the Loire River. It was easy finding parking and hungry as we were, we ate at the first place, L’Ambacia, that had something vegetarian. I had a croque chevre, foreshadowing the fact that in the next few days I would eat enough goat cheese for a life time. It was delicious and I enjoyed a local Chardonnay wine as well. John had a burger, which was satisfying, but he felt very disappointed in himself for getting something so familiar. Then we wandered the town, took pictures of the chateau, and watched the swallows flying around the towers. After a good walk, we had crepes at L’Amboiserie for dessert. John’s crepe had chocolate and lots of chantilly cream, while mine was a Calvados flambee (tasty, but without as much fire as I’d hoped). The waitress wore leather pants which did not go unnoticed. 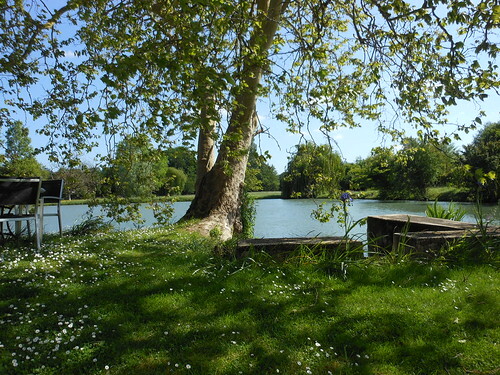 At the end of a long, but good day, we opened our sparkling Vouvray back at the mill pond and enjoyed the quiet night. Check out the list of movies I've been working through since October 2011! I was super nervous and now I’m super happy! I rode my bike to work!! We moved! Things are still messy with furniture going and coming, but someone is finding new spots. Excited to make my debut at Bistrot Lepic in upper Georgetown next Monday! Vraiment! Thanks to @koellej for the poster. Lanahj Create a free website or blog at WordPress.com.